This evening I am running a two hour session on women’s magazines for my local council’s adult education service. I can’t remember at what point I thought that developing a whole new talk to deliver to a whole new type of audience in the last week before Christmas was a good idea but despite end-of-the-year fatigue, I am looking forward to it. Most of all, I’m relishing the opportunity to discuss women’s magazines in a really “big” way with no limits on topic or time period, something I’ve never been able to do before (this was a big factor in accepting the offer). However, because of this vastness, I’ve wrangled a lot about how to structure the session so that it doesn’t just degenerate into “Here is everything I know about women’s magazines”. I’ve gone with focusing on the different factors that shape such publications (publishers, editors, advertising etc), trying to mix group work, analysis and anecdotes. I had originally planned to use Prezi for the first time but decided this was too much of a risk (especially as I don’t think I’ll have internet access). In the end I haven’t even used PowerPoint as I don’t want to overwhelm the audience with visuals. Instead, the publicity posters requested attendees bring a magazine along with them so people have a focus to look at and a concrete example to consider as we move through the session. I am also taking a pile of old magazines in case anyone doesn’t bring one of their own. From this pile, I’ve picked out a few to hold up and talk about at certain points, including the first issue of Clique, my latest obsession. When sorting through what to take, I came across some old Christmas issues of women’s magazines from the 1950s. Leafing through them, I was struck that whilst we tend to bemoan the season’s commercialism and hyped up idealism as if they were a recent phenomenon (think John Lewis’ picture perfect advertisements), actually these trends have a much longer history. 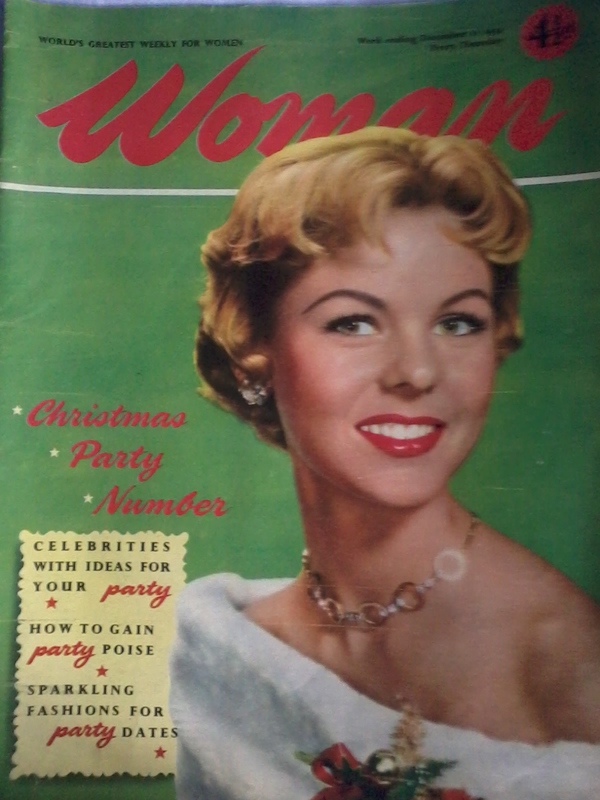 I mean, who doesn’t glam up like this 1954 Woman cover for their office party?! 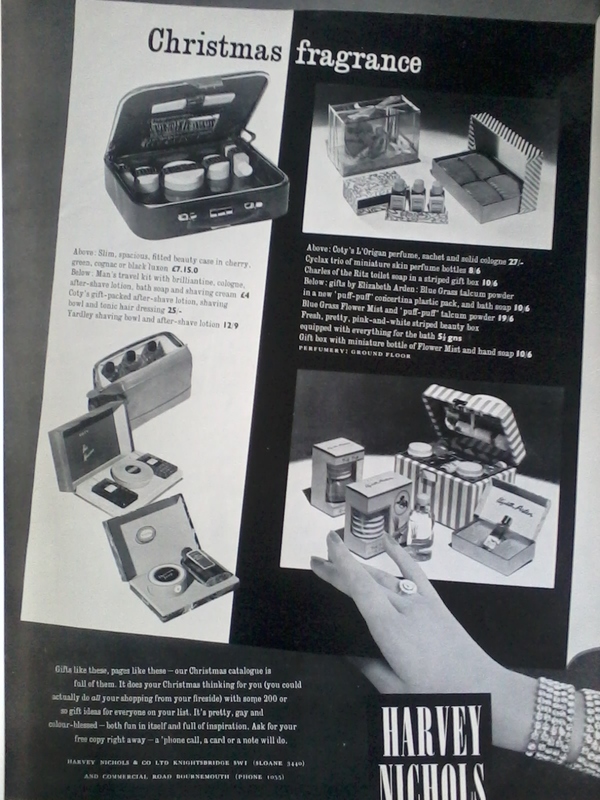 And never mind the Boots catalogue or the perennial “What to buy the woman in your life” lists that populate Sunday supplements throughout C21st Decembers, this 1954 advertisement for Harvey Nichols in The Queen‘s “Christmas number” certainly peddles some cosmetic gift sets (there’s a fair bit of bling on display too, presumably also available within the store). These images of Christmas past, taken from a year when the last vestiges of rationing had only just been lifted in Britain, bought to mind an even older comment from George Orwell about the festive season: “Christmas is forced on a reluctant and disgusted nation by the shopkeepers and the press: on its own merits it would wither and shrivel in the fiery breath of universal hatred; and anyone who looked back to it would be turned into a pillar of greasy sausages”. Retailers and the media pushing their Christmas agenda onto an unwitting public? Was it ever thus? A copy of yesterday’s Stella , The Sunday Telegraph‘s women’s supplement, has just crossed my lunch table and I almost choked when I clocked ‘From the Editor’. ‘Welcome to the first ever interactive issue of Stella‘, it reads, going on to say ‘It is as easy as 1-2-3 to access our exciting extra content with your smartphone or tablet…get scanning!’. The following pages contain symbols that when scanned reveal videos as well as the ability to buy some of the goods shown, as readers can with Clique, the new ‘clickable’ fashion and beauty magazine that I wrote the other week. Of course this timing may be a coincidence, but I wonder if the Stella production team decided to run this ‘special interactive issue’ in response to the new launch. Not that Clique is likely to become a rival to Stella in terms of audience or even advertising revenue, but even so the latest title on the block does seem to be pioneering in a direction that other publications with similar content are already following to some degree or another. Is Stella attempting to ride the crest of this new wave too? It looks that way, although it is notable that the high end brands are on board. The advertisements for Lancome and Valentina fragrances, for example, occupying the premium pages near the front of this Stella issue, are not scannable. In fact, a quick scan (pardon the the pun!) through the issue reveals that the only advert from which the reader scan buy directly is for Amazon and the latest series of The Paradise on DVD. Other advertisements encourage shopping via their website or app, but are not actually clickable themselves. This may be because there wasn’t time in the production of Stella to get interactive advertisements (lending weight to the idea that the whole special issue is,directly or indirectly, a response to Clique‘s launch). However, for clickable content to have a sustainable future that outlasts the immediate novelty value, advertisers from across the spectrum will need to be in on the act to support (ie subsidize) the inevitable rise in production costs and expenses that interactive editorial content will bring. If the Debenhams beauty advertisement on the facing page doesn’t move to being clickable, for instance, then I don’t believe that ‘Scan page to shop and to watch make-up video’ option will last longer than the occasional special issue. 11th February 1990: I am seven years old. It is almost time for our Sunday lunch and I tell my mum that I’m perished, only to be informed that ‘famished’ is the word that I am looking for. At that moment, my dad calls me into the sitting room and instructs me to be quiet and watch what is happening on the television. Take all this in and remember it, he says, because This Is Important. There are crowds and BBC News reporters talking in earnest tones. It is all about a black man from a faraway land being released from prison. I’m confused; isn’t prison where people go when they have done something bad? Why are people happy that he isn’t in prison anymore? I felt as I had a couple of years earlier when my dad had done the same thing and uttered the This Is Important statement when the Berlin Wall came down: clueless as to what was really happening, a bit scared about what it all meant (would we have to live on tins of baked beans for weeks? How Cold War fears lingered on in the late 80s) but also excited that I was watching Something Important unfold – and pleased that my dad considered me grown-up enough to observe Important Events with him. 6th December 2013: the same news outlets are now reporting Nelson Mandela’s death yesterday. There are lots of references back to twenty-three years ago, stirring up my memories of the time. Now I understand why It Was Important. Yet even though I couldn’t comprehend then what Mandela’s release meant, it was still a significant moment in the development of my political consciousness. I was just too young to remember sporting controversies or product boycotts or even The Specials AKA single, so this was my first mindful encounter of the word Apartheid and the horror of what it entailed. Already the proud owner of the Band Aid II single, I was introduced to another manifestation of inequality on that day. Furthermore, my initial reaction – isn’t prison where people go when they’ve done something bad? – continued to niggle away afterwards. Mandela challenged my childish perception of nice people and naughty people, showing me that the judgments made in Courts of Law are not necessarily the ultimate arbitrator of right and wrong (as if such neat and tidy concepts even exist). Of course I did not put in into those words at the time. I just felt different. It is only as an adult looking back that I recognize what happened: Mandela’s release unsettled my worldview, raising big, complex questions that I’ve wrestled with ever since around justice, inequality and the actions that we as individuals and groups are prepared to take to address such issues. With his death and the outpouring of other people’s reflections on his impact, I’ve realized that this unsettling, this challenging, this questioning, is his legacy in my life. 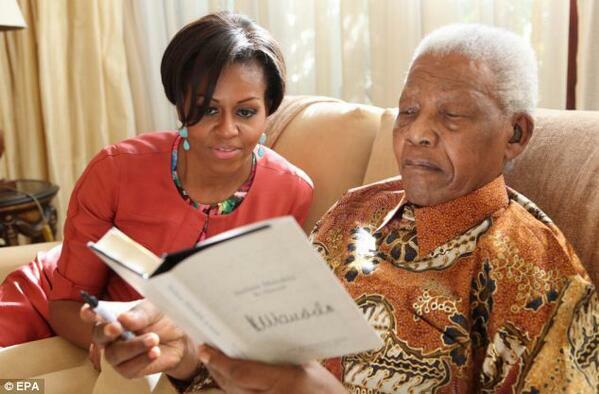 Mandela changed the world. Mandela changed me.